The Boys and Girls Club of Wetaskiwin launched the new ‘Rogers Raising the Grade’ program on November 6th, 2012. Since that time, hundreds of young people have participated in the program that offers after school enhanced supports and diverse learning opportunities for youth. “ With local students just finishing exams and realizing they might need just a little bit more assistance, this may be the ideal time for them to check into the Rogers Raising the Grade program,” stated Justin Wieclaw, the Boys and Girls Club’s Education Program Director. “This is the second year we have offered the free program, open to any Wetaskiwin youth from 12 to 19 years of age.” continued Wieclaw. With the support of the Rogers Youth Fund, Boys and Girls Clubs of Canada are delivering a multi-faceted education program called Rogers Raising the Grade, aimed at increasing academic skills, high school graduation rates and access to post-secondary education for at-risk youth in a select group of Boys and Girls Clubs across the country. 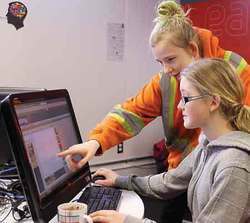 It is an interactive after-school program that allows youth to explore their personal interests, receive homework support and connect with local volunteer mentors and/or tutors, interact with peers, increase their digital literacy, and plan for post-secondary education. Wieclaw feels that the youth of Wetaskiwin have access to a very unique opportunity. “This is a program that is focused on the youth. One of the outcomes we have been observing is the increased level of confidence among the participants. If there is something they want to do we will help.” The basement of the Boys and Girls Club facility has been equipped with state-of-the-art computers loaded with selected software that will become, “A place for youth to come to do homework, projects and including resumes for summer positions”. The new program is available to youth ages 12 to 19. “The program is free. It’s a drop in. A first come, first serve. They can come and check it out and if they want to continue to come in there is a registration form to fill out. We want it to feel more like home for the youth. Here we can interact with the youth. We have a high focus on technology that is used to help youth with homework, research and other learning opportunities.” Youth will have facilitated access to all information sources the software and the internet have to offer. The Rogers Raising the Grade Technology Centres will provide youth with a designated space delivering access to high-speed Internet and current technology including computers and other electronic resources to support learning. They offer a positive, collaborative environment in which youth feel comfortable and engaged. For more information about the program please contact Justin Wieclaw, Education Program Director at 780-352-4643 extension 38 or email justin@wetaskiwinyouth.ca.